There are 36 Assisted Living Facilities in the Homer Glen area, with 2 in Homer Glen and 34 nearby. The average cost of assisted living in Homer Glen is $5,000 per month. This is higher than the national median of $3,346. Cheaper nearby regions include Orland Park with an average starting cost of $3,791. To help you with your search, browse the 331 reviews below for assisted living facilities in Homer Glen. On average, consumers rate assisted living in Homer Glen 4.4 out of 5 stars. Better rated regions include Mokena with an average rating of 4.7 out of 5 stars. Caring.com has helped thousands of families find high-quality senior care. To speak with one of our Family Advisors about assisted living options and costs in Homer Glen, call (855) 863-8283. Promotion ends in 284 days! The charming village of Homer Glen is located just 32 miles from downtown Chicago, yet its plentiful parks and forest preserves give it an idyllic small-town atmosphere. About 17 percent of the approximately 24,600 residents are age 65 or older, creating a thriving senior community. Although only two assisted living facilities are available in Homer Glen itself, its convenient location in the Chicago suburbs means that an additional 34 facilities are located nearby. Assisted living facilities in Homer Glen are regulated by the Illinois Department of Public Health, which oversees all assisted living facilities in the state. Illinois law requires these facilities to provide three meals a day to residents, among other services. The crime rate in Homer Glen is very low, averaging about 77 percent lower than the Illinois average and 79 percent lower than the U.S. average. Homer Glen was named the safest community in Illinois based on the FBI's Uniform Crime Report statistics. Homer Glen has a higher cost of living than average. However, that is largely due to high housing and transportation costs, which may not apply to seniors in assisted living. Residents of Homer Glen typically spend less on groceries and utilities than the national average, and health-related costs are about average. The Homer Glen area is home to world-class medical facilities, including Silver Cross Hospital, in the event of a medical emergency or illness. Homer Glen typically gets about 30 inches of snow and has winter lows around 16 degrees, which can make it difficult for seniors to stay active. Summer highs tend to be in the mid-80s. The air quality in Will County, which includes Homer Glen, was given a "B" grade by the American Lung Association. Ozone levels are rarely dangerous, which may make it a good choice for seniors with respiratory issues. Seniors who no longer drive can take advantage of Homer Glen's multiple public transportation options. Pace Bus offers a route through the village that connects to neighboring communities. The Metra commuter rail system also runs through Homer Glen, although the nearest stations are in neighboring Orland Park. Both offer discounted fares for senior riders. Assisted Living costs in Homer Glen start around $5,000 per month on average, while the nationwide average cost of assisted living is $4,000 per month, according to the latest figures from Genworth’s Cost of Care Survey. It’s important to note that assisted living rates in Homer Glen and the surrounding suburbs can vary widely based on factors such as location, the level of care needed, apartment size and the types of amenities offered at each community. 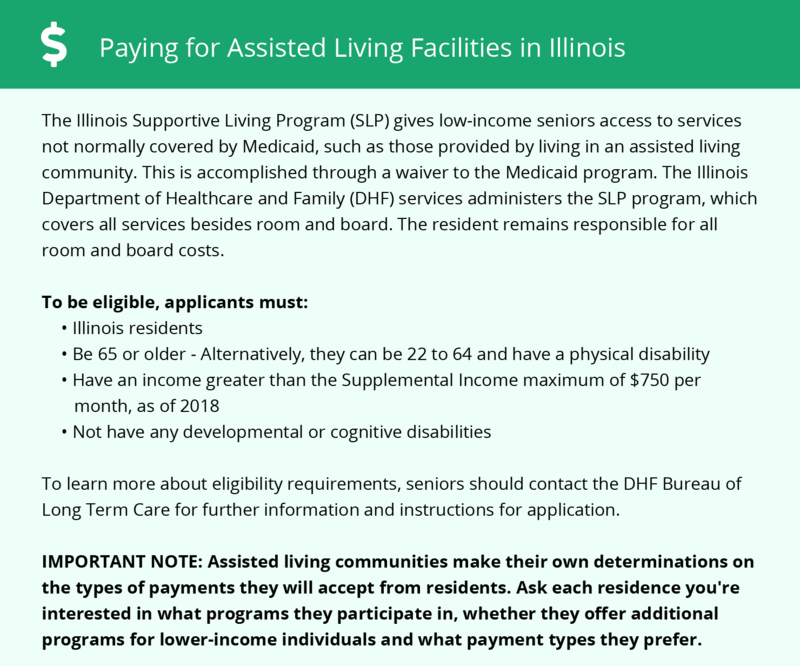 Seniors who receive Medicaid may qualify for the Illinois Supportive Living Program, which helps pay for assisted living services not otherwise covered. Illinois also offers the Community Care Program to eligible seniors, which also pays for assisted living services. Homer Glen and the surrounding area are home to numerous government agencies and non-profit organizations offering help for seniors searching for or currently residing in an assisted living community. These organizations can also provide assistance in a number of other eldercare services such as geriatric care management, elder law advice, estate planning, finding home care and health and wellness programs. To see a list of free assisted living resources in Homer Glen, please visit our Assisted Living in Illinois page. Homer Glen-area assisted living communities must adhere to the comprehensive set of state laws and regulations that all assisted living communities in Illinois are required to follow. Visit our Assisted Living in Illinois page for more information about these laws.